Congrats to the Winners! Don't forget - you have 5 days from today to to e-mail us at info@newtonsnookdesigns.com with your full name and email address to claim your prize. (it's also easiest if you already have an account set up in our shop). This Bee is happy to bee a winner at Newton's Nook Blog Hop Day 2. Emailed & set up account at store. Looking fwd to shopping. 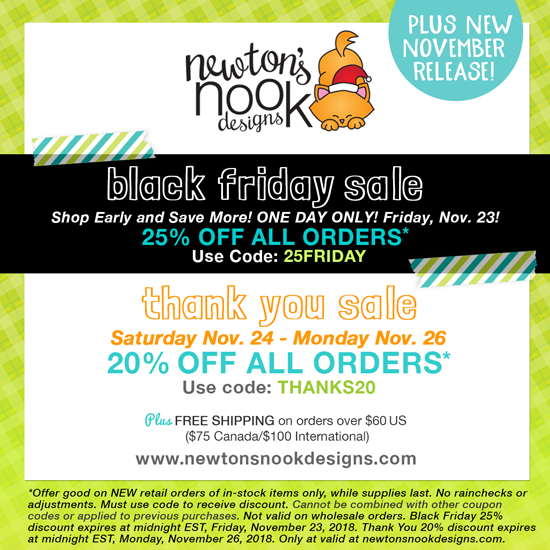 I currently have 2 Newton's Nook stamp/die sets that are Simon Say Stamp Stamptember releases.